In her new book Why Have Kids? that went on sale September 4, author and high-profile feminist Jessica Valenti is very forward about wanting to stir up controversy and frustration that evolves into productive conversation on what it's like to be a modern day mother. She does this boldly, by broaching moral and logistical problems facing today's moms supported by interviews, research and personal experience. Here Valenti offers an in-depth exposé of having children -- and the realities of its associated rewards, guilt and daily exhaustion -- bringing a discussion out into the open that most of us moms think that we have been alone in experiencing. Point blank, she says, the incompatibility of parents and our kids lifestyles today is hurting us both. Instead of focusing on the debate over breastfeeding, for example, the author suggests that what moms really need to do is create communities that can effect collective change in the motherhood status quo. Places that are supportive to all, rather than forming groups of judgment that don't work toward the common goal of every parent: to be happy. In summary, Why Have Kids? doesn't mince words. Valenti describes the challenges and problems confronting modern parents in great detail and then provides a variety of solutions that can bring joy and satisfaction back into parenting. Why Have Kids? 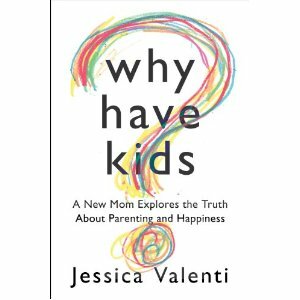 A New Mom Explores the Truth About Parenting and Happiness by Jessica Valenti, 208 pages (Amazon/New Harvest) is available in hardcover ISBN: 978-0-8050-9412-1 $23.00 and in digital format ASIN: B008L4KT6W for $9.99. For more information visit http://jessicavalenti.com and/or follow the author on Twitter. FTC Disclosure: This review was made possible by Mom Spark Media. Thoughts are my own. I received a copy of Why Have Kids? and compensation for my time investment and work on this campaign. See complete FTC Disclosure information that appears at the bottom of MommyBlogExpert's main page and at the bottom of every individual post on this blog, including this one.